A gruesome name (from the novel by Jeffrey Eugenides) for a pretty scarf. This was a simple design (cast on 190 stitches and work approximately 46 rows), but it took a long time to get a pleasing sequence of colors. In some ways, this was the most challenging of all in terms of design, although it doesn't look it. Note that the 12 rows on each edge are mirror images. This is one of my favorite scarfs, perhaps second favorite to Blue Shoes and Happiness in part 1. This scarf is not named for a book. 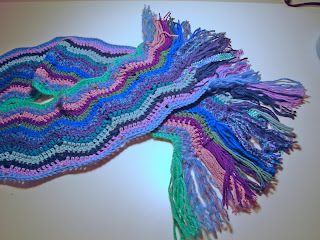 It is crocheted, and as may be obvious, started out as an afghan. I liked this strip of afghan so much I decided to fringe it and it became a scarf. Much of the fiber is leftover acrylics from a series of Doctor Who scarves my daughter made several years ago with some additions. I was very tempted to keep this scarf, but I ended up giving it as a belated Christmas gift in early 2007.
pattern in Interweave Knits booklet, sent with magazine subscription. It was published in the Spring 2000 issue. This scarf is named for the recipient. 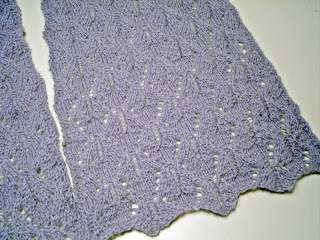 It was my first knitted lace project and with thin yarn on small needles, it took forever. The leaf-shaped lace was easy and the pattern made it's own scallops on the edges. The repeated lace motifs were 11 stitches wide (I forget how many there were - Maybe 10?) and I separated them with markers. 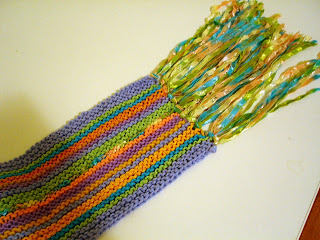 The scarf was knit in two parts and grafted together in the center. This was also my first attempt at Kitchener Stitch, and I found it surprisingly easy.